We visited Ruth Winston House last month and interviewed Jean Waller and Yvonne Quigley who told us about the courses run there. It looks like a great place to be. Ruth Winston MBE was an energetic and forward thinking Mayor of Southgate and she set up RWH over 50 years ago. It runs a huge variety of courses for over 50’s. The link will take you to the archive and you then have to click on the screen which says 21. The film celebrates the 21st anniversary of the 85 Air Training Squadron Southgate and it includes film of Ruth Winston who was at the time deputy mayor of Southgate, film of Oakwood school, Southgate Town Hall and Broomfield Park with its wonderful sporting facilities. Born in 1926, Betty Wright nee Walton lived in Southgate town hall. Her father was station officer at the fire station ajacent and also the mace bearer for the Council. “One night in March 1941, the Dance Hall (held in the Princes Hall above Pitman’s College) in Green Lanes, Palmers Green was bombed. 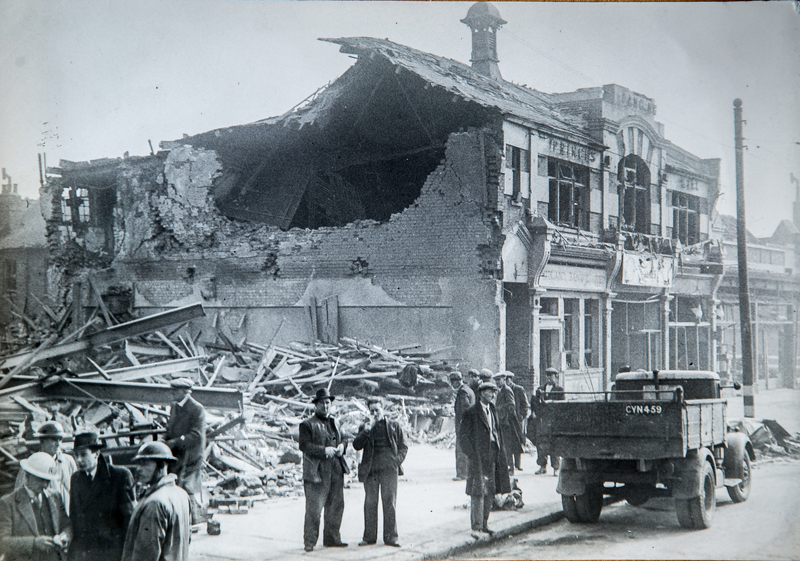 A German bomber ‘plane was overhead…and tragically his bomb carriage was blown off, so all the bombs came down together in Palmers Green.